We recently hit an issue during testing with Apache returning “502 Proxy Errors” to clients who were connecting via CometD (using Apache as a proxy server in front of a Camel/Jetty CometD server). We are using a combination of CometD, Camel (in ActiveMQ) and Apache to broadcast messages from our server to subscribed browser clients. CometD is a scalable HTTP-based event routing bus that uses an Ajax Push technology pattern known as Comet. Comet is a web application model using long-held HTTP requests which allow the web server to ‘PUSH’ data to a browser, without the browser specifically requesting it. This endpoint uses the Camel CometD module to run a Jetty instance on port 9099, which handles the CometD endpoint. As a general rule, using Apache as a proxy in front of a CometD long-polling/Bayeux server is not a good idea. This is due to Apaches ‘thread-per-request’ model – which introduces problems when scaling this solution. The problem is caused by the Apache proxy server timing out before the JettyCamel server (using the default configuration). 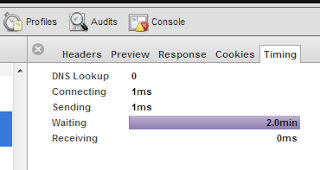 By default, Apache Timeouts are set to 2 minutes (as defined globally in httpd.conf). Decrease the timeout on the Camel server to be less than 2 minutes, e.g.